WASHINGTON (CNN) -- President Barack Obama on Tuesday admitted he made a mistake in handling the nomination of Tom Daschle as his health and human services secretary, saying Daschle's tax problems sent a message that the politically powerful are treated differently from average people. 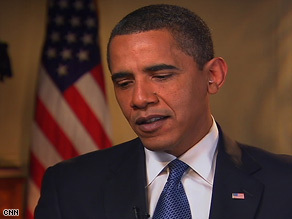 President Barack Obama is interviewed by CNN's Anderson Cooper on Tuesday. Daschle, the former Democratic leader in the U.S. Senate, withdrew earlier Tuesday as news that he failed to pay some taxes in the past continued to stir opposition on Capitol Hill. "I think I screwed up," Obama said in a wide-ranging interview with CNN's Anderson Cooper. "And I take responsibility for it and we're going to make sure we fix it so it doesn't happen again." Daschle recently filed amended tax returns and paid more than $140,000 in back taxes and interest for 2005 to 2007. Those tax issues, as well as questions over whether work he did after his stint in the Senate amounted to lobbying, gave critics ammunition to question Obama's call for a change of culture in Washington. Obama defended Daschle's original appointment, saying "nobody was better-equipped to deal both with the substance and policy of health care." "He understands it as well as anybody, but also the politics, which is going to be required to actually get it done," Obama said. Earlier, White House spokesman Robert Gibbs insisted Daschle's decision to withdraw was made on his own, not as a result of any prodding from the administration. Obama also said he's going to crack down on businesses using taxpayer money to excessively pay executives. He plans a Wednesday announcement of mechanisms to keep that from happening. The president also spoke about the struggling economy, the use of the label "war on terror," and lighter topics, including the family dog and his efforts to stop smoking. Thinking about the nation's faltering economy keeps him up at night, Obama said. He also addressed criticism that there is too much spending in the current stimulus package bill written by House Democrats. iReport.com: Was Daschle properly vetted? "Look, the only measure of my success as president when people look back five years from now or nine years from now is going to be, did I get this economy fixed. I have no interest in promoting a package that doesn't work," Obama said. Cooper also asked Obama about reports that he is not using former President Bush's phrase, "war on terror," to refer to the wars in Iraq in Afghanistan. Moving on to lighter topics, the president said the first family hasn't decided what type of dog to get, but will wait until spring. Obama, an intermittent smoker, also said he has not smoked on the White House grounds. "You know, when I think about Abraham Lincoln, what I'm struck by is the fact that he constantly learned on the job. He got better. You know, he wasn't defensive. He wasn't arrogant about his tasks. He was very systematic in saying, 'I'm going to master the job, and I understand it's going to take some time.' "